AAF operates 18 C-130 transports, including 8 C-130H, 8 C-130H-30, and 2 L-100-30 models. Received 6 C-130K, 3 L-100-20, and 2 L-100-30 aircraft. None in flying condition now. Cameroon Air Force Lockheed C-130H Hercules 1989. A C-130H captured in airworthy condition with 3 others at Gamal Abdul El Nasser Air Base. 88 MAG based at Lagos (C-130H, C-130H-30). On 26 September 1992 a NAF Lockheed C-130H Hercules serial number 911 crashed three minutes after take-off from Lagos, Nigeria when three engines failed possibly due to high take-off weight. All 158 people on board were killed, including 8 foreign nationals. The Indian Air Force (IAF) inducted its first C-130J-30 Super Hercules on 5 February 2011. The remaining five on order were delivered by the end of 2011, and operated by 77 Squadron, the Veiled Vipers. 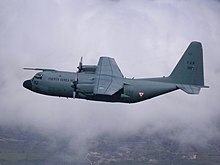 On 3 October 2011 India announced its decision to buy six additional C-130J-30 Super Hercules with one more to replace the crashed aircraft taking the total to 12. The IAF has five C-130J-30s in service as of January 2016. C-130E, C-130H and 1 RC-130. The Japan Defense Agency ordered the C-130H which was the newest model in 1981. The Japan Air Self-Defense Force (JASDF) purchased 16 in total to replace aging C-1 and YS-11P aircraft. The C-130Hs were received from 1984 to 1998. JASDF C-130Hs were active in Iraq from 2004 to 2008. Two C-130Hs (95-1080 and 95-1083) have been equipped with aerial fuel-receiving and refueling functions, making them of KC-130H standard. This provides the JASDF with the ability to refuel the UH-60J search and rescue helicopters of its Air Rescue Wing. The JMSDF bought six used KC-130R aircraft that were in storage, having been previously operated by the US Marines. There was some speculation that they may be used as gunships with the Harvest HAWK kit. In actuality they were purchased to replace three aging YS-11M/M-A aircraft of Air Transport Squadron 61. Their air to air refueling equipment was removed, making them of C-130R standard. Corrosion repair was done and the aircraft were refitted with new landing gear supports, cargo door supports and center wing rainbow fittings. In addition to structural modifications, Japan received thirty overhauled T56-A-16 engines and digital cockpit upgrades to include a digital GPS. Regeneration of the first aircraft began in November 2012 and was planned to be completed by Fall 2013. The six C-130Rs were supplied from 2014 to 2016. 222nd Airlift Sq, 220th Airlift Wing, Benito Ebuen AB, Mactan Island, Cebu (C-130B/H) . Currently, 3 C-130B/H in service plus 2 C-130T purchased from the United States and delivered in October 2016. Another B model is planned to be repaired and overhauled . 122 Squadron – 5× C-130H, 1× KC-130H, 2× C-130B (ex-USAF) and 2× KC-130B (ex-Royal Jordanian Air Force airframes) based at Paya Lebar Air Base. Starting from 2010, all 10 aircraft will progressively undergo an extensive modernisation/upgrade process by ST Aerospace to bring them up to a common standard (K/C-130H3) with the replacement of cockpit flight management system by a modern glass cockpit avionics suite, central engine displays to replace analogue gauges, improved voice communications, digital autopilot, flight director as well as a digital weather radar, which will make the aircraft Global Air Traffic Management (GATM)-compliant. Also, the C-130Bs will receive an auxiliary power unit and environmental control system in common with the C-130Hs. Introduced into service in January 1988. Currently operates 12 X C-130H and older versions. 4 X C-130J in order (2 C-130J were delivered in 2014). Former operator. No longer in service. 32 C-130A's were supplied in 1972 as part of Operation Enhance Plus, forming two transport squadrons (435th and 437th) based at Tan Son Nhut Air Base . Lockheed C-130H30 Armée de l'Air at Paris Le Bourget IAP in August 2012. 14 Eskadra Lotnictwa Transportowego, Powidz (5 ex-USAF C-130E Hercules overhauled and delivered to Poland in 2009–2012 as part of military aid, 3 more C-130E leased between 2009 and 2012 as interim solution, two of them are retired and given to Poland for spares, last one returned to USA). Sweden has operated eight C-130 aircraft (locally designated the Tp 84), originally delivered as C-130Es beginning in February 1965. They were upgraded to C-130H standard in the 1980s and are assigned to Skaraborg Air Force Wing (F 7), 3 Transportflygenhet based at Såtenäs. The first aircraft delivered as withdrawn from service on 9 June 2014, with the second scheduled to follow shortly. All C-130 aircraft in Turkish service were to begin a 56-month upgrade by Turkish Aerospace Industries termed the Erciyes Program. Two are to be done directly at TAI while the remainder will be upgraded by the Air Force under TAI oversight. Primary aim of the upgrade is to improve the avionics with 17 new systems and five upgraded ones. Turkish content in both hardware and software has been increased to reduce long term costs. Formerly - No. 70 Squadron – RAF Lyneham (C.1/C.3) - converting to A400 M.
In 2001 FAB obtained ten ex-Italian Air Force, (AMI) C-130H models, which were replaced in Italian AMI service by new C-130J's. Pacific Western Airlines for cargo operations had 2 aircraft. 7 L-382 Hercules for cargo operations; largest civilian operator in the world. 5 Lockheed C-130A Hercules for specialized aerial operations; largest civilian specialized aerial services operator in the world. ^ "World Air Forces 2016 pg. 11". Flightglobal Insight. 2015. Retrieved 28 March 2016. ^ "Directory: World Air Forces". Flight International, 14–20 December 2010. ^ "India to acquire six more C-130J aircraft – The Economic Times". The Times Of India. 2 October 2011. ^ "Boeing Team Delivers C-130H Aerial Refueling Tanker to Japan". Boeing Company. 20 April 2010. Retrieved 27 September 2017. ^ "C-130H added aerial refueling and reputation Archived 11 March 2010 at the Wayback Machine"(Japanese). Asagumo News. Retrieved 25 April 2010. ^ Mizokami, Kyle (27 February 2012). "The Mystery of Japan's KC-130 Buy". jsw.newpacificinstitute.org. Retrieved 11 November 2017. ^ "Japan Maritime Self-Defense Force C-130s". Retrieved 9 November 2017. ^ Jennings, Gareth (28 October 2016). "Philippines receives second and final C-130T airlifter from US". IHS Jane's 360. Retrieved 28 October 2016. ^ "Lockheed Martin Receives Contract For Four C-130J Super Hercules Aircraft For Qatar" Archived 13 August 2011 at the Wayback Machine Lockheed Martin Press release, 7 October 2008. ^ Greg Waldron (12 November 2010). 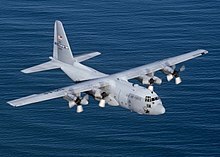 "Singapore's C-130 upgrade makes progress". FlightGlobal.com. Retrieved 28 June 2011. ^ Lockheed C-130 Hercules w Wojsku Polskim. ^ "Swedish Air Force's First Hercules Withdrawn from Use". Air Forces Monthly (317): 11. August 2014. ^ "Turkey Taps TAI." Aviation Week & Space Technology. 11 December 2006. ^ Australian Department of Defence media release Royal Australian Air Force Squadrons Celebrate New Role. 17 November 2006. This page was last edited on 15 March 2019, at 12:25 (UTC).